A protest took place today outside Government Buildings to coincide with the visit of Canadian Premier Trudeau. The protest was in opposition to the proposed EU Canadian Comprehensive and Economic Trade Agreement and to call for the rejection of the deal by the Irish Government. 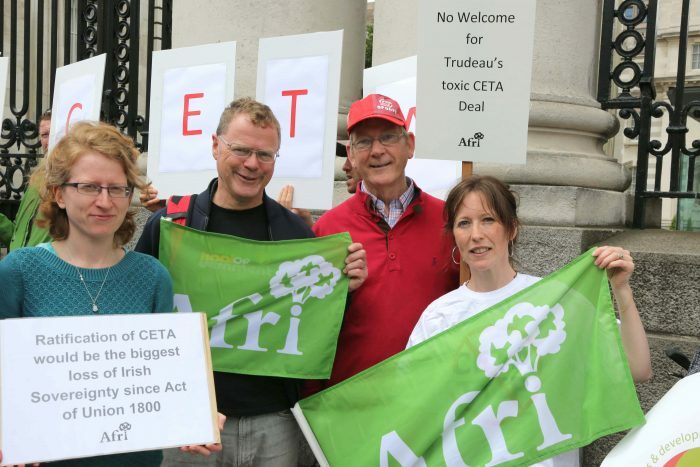 The protest was organised by Comhlamh and supported by Afri and participants expressed concerns as to how CETA will compromise laws which protect health, the environment, and the rule of law in the EU. Participants also urged the Government to hold off on any vote to ratify the deal until the European Court of Justice examines the legality of CETA under EU law. Protestors are particularly alarmed by the notorious Investment Arbitration System, included in the deal, which allows foreign big business to sue Governments when their actions impact on their profitability.